Todd Sheets is quite possibly the best known director among the shot on video filmmakers of the 1990’s. His work garnered a large following despite budget shortcomings due to the buckets of blood he heaped upon viewers in each and every work. But like all filmmakers, Todd had to start somewhere, beginning his career making shorts on super 8mm and analog video. And now, for the first time ever, SRS Cinema is bringing them to you on 2 compilation releases including up to three hours of these never before seen works. “Sheets of Gore” Vol 1 and 2 on limited edition VHS and Bluray! 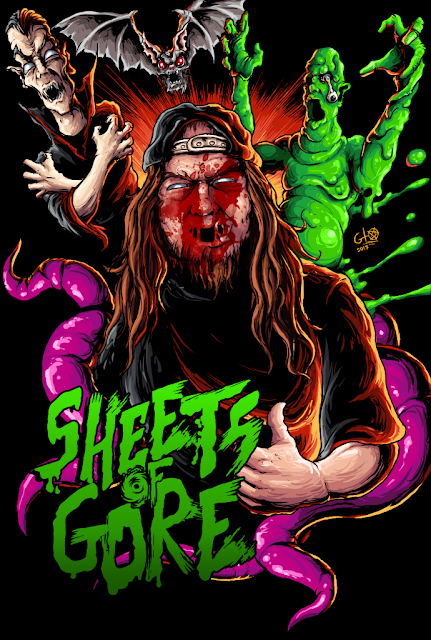 Gore master Todd Sheets has been piling on the blood and guts for nearly 3 decades, with such shot on video cult classics as “Zombie Bloodbath”, “Goblin”, “Violent New Breed” and many more, and more recently with hits like “House of Forbidden Secrets” and “Dreaming Purple Neon”. Now see where the gore began with Todd’s earliest shorts in the compilation video! Warning: Not for the squeamish or faint of heart! Note that the blurays are professionally run and silk-screened BD-R by discmakers. All editions are expected to ship around late July 2017. Each volume will have between 70-90 mins of shorts from Todd, and may be a mix of early shot on analog video work and super 8mm film. The best available materials were used in the making of each volume and may be rough in spots. A DVD release will follow in early 2018. For now the plan is one DVD with 90-120 mins of selected shorts from the 2 volumes. So the only way to see all the shorts for now will be on the Blurays or VHS releases.